I have been blogging for about 6 years now. I have gone through a couple of blogs for many different reasons along the way, but for the most part, my path to why I write has always been the same path going forward. I started off in little bits and pieces in writing about the easier things like family, my boys, and the life being a mom and my everyday thoughts. I then I began testing the waters and slowly starting to talk about things that I believed in like God, Hope, and my Faith. I then dove right in and began my journey by writing about the pain and suffering, and life being a survivor of child sexual abuse – the journey to healing and what my everyday struggles and trials are about. The moment I directed my writing from “God” to “Abuse”, people dropped off from my blog, while others slowly walked in and took a seat in the back just watching from a distance. Some feeling unsure if it was safe to read or see someone have a voice around something that is considered to be”voodoo”. Every Friday I participate in “Five Minute Friday”, I am the admin for the FaceBook Page of Five Minute Friday, and I notice that a huge percentage of the people who write are faith based, and beautiful so. The writings are usually about Faith, God, and family along with the every day struggles, but mostly faith based – as where my writing is about my healing journey, and the very day struggles as an abuse survivor who also suffers from severe Post Traumatic Stress Disorder. I notice each week while reading through a lot of these blogs who participate in the Five Minute Friday, that I struggle to find someone else like me and I say to myself “but I am faith based, I am a lover of God, but where are the people who suffer like me and write about it?”. Sometimes it can feel a little lonely. I look at these blogs out there and they have comments upon comments from people all over the world who are leaning in and connecting with each other, and you can see the fan base of each blog overflowing with thousands of “likes” because in a sense, “its easier to talk about faith and God” vs “abuse and suffering”, that is not a judgment, it’s a truth. Over here in my corner, I have people who quietly sit on the side-lines just reading, looking along, and later send me an email about how “they” understand, or how “my story” resonated with them and how they wish they had a voice to speak of the truth that pains them. I do also have the few who stand strong along side of me and let their light shine with me, and I am so blessed for those few who do take the vulnerable seat next to me, and I am truly blessed that the few I can reach connect with; understand what its like to endure the everyday battle. I look at my blog and my blog is full of GOD, full of GRACE, full of Faith, but it’s seen in a different light. Its through my voice that God shows up in a whole different way and its risky and vulnerable. I am a victim of child sexual abuse, and my voice is spoken through words of truth. I don’t write about my daily prayers, or my moments with God per-say, its through God I write about my every day struggles and the healing journey it takes to move through it. I write about the pain an suffering that I endure while healing from the wounds that bind me. I put my voice out there in ways I was never told to do, and lets face it, that is a scary vulnerable place to be. Honestly its not for everyone and a lot of my readers sit in the back hoping not to be seen. I sometimes wonder just how many people out there wish they could write about their pain, be seen and feel accepted just as they are. The blessing of this blog and my writing is: although I am not talking about morning devotionals and prayers about the God I so love, I get to use my voice in a way a lot of others can’t. I get to use my words to heal and to be the very way I was always told not to be. The truth I speak is a part of the journey, the journey I believe God intended me to take. The curse: I don’t get to meet those people who sit way in the back. 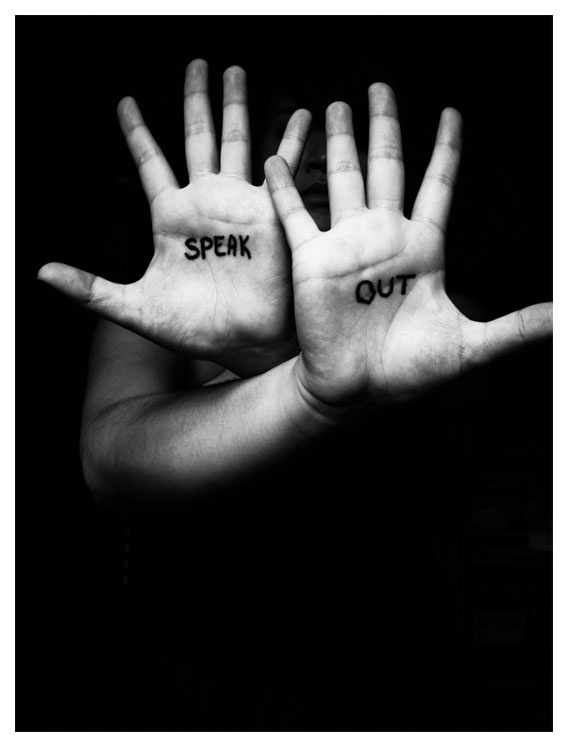 I don’t get the thousands of people pouring into my blog to connect with me, because of the stigma that abuse survivors deal with is – “don’t talk about it” or “we need to be silent”. I sometimes wonder why is it so easy for people to embrace a blog filled with writings about God and the faith, and yet its hard for people to embrace writing of pain and suffering and or writing the truths of being a victim of their sufferings. If you look between the lines of what is hard to look at and all the truth I write about, you will see that my writing and my blog is all about God, all about faith, all about hope and grace, Its there, you just need to read, look and connect to it. I am Karen! I am a child of God, a catholic, a mom, a wife, and I love my faith! I am also a child sexual abuse survivor who has a very sad story, and a painful past and I have a habit of speaking my truth… and I wouldn’t change a thing! So as I sit here sometimes envying or wishing I had the kind of blog that had “a thousand likes”, or a “hundred comments” to connect to, I have one thing that can never compare and that is “a voice to speak hard truths”. I am blessed to have a place where I can write about whatever it is I am called to write about, and I never have to hide from who I am, or what it is I stand for. I may not have the most popular blog, but what I do have is a voice; a voice that speaks truth, and that is by far the best gift I could ever receive. I am honored and blessed to connect to those who I can reach. awwww thank you Melissa :) I so appreciate that :) I am glad to have you as a friend .. I am a survivor of child sexual abuse, and I write about my pain and my healing. My writing is often hard to take…because I write the truths that emerge during my therapy and all the pain that erupts with it. I understand what you mean by this. I have a few loyal readers whose comments I treasure and have lifted me out of the darkest pit. There are also those who read from a distance, perhaps in too much pain to come in close enough to comment. I often wonder what kind of hearts I reach…I’ll never know, but I do know that my writing has been an integral part of my healing process and has brought amazing changes in my life. The comments have been icing on the cake. Thank you for letting your voice be heard. I understand first hand how much courage this takes. There are so many who suffer quietly from this abuse. Perhaps we are inspiring others to start writing also, or speak out in any other way. The readers may be silent, but it does not mean they are not touched.